Prem Nirmal: Buddhas by Batches? Welcome to Prem Nirmal's blog. Here you will find interesting articles and Videos on Naadi, Meditation, Enlightenment, Liberation and Ascension! Also you will find many useful articles on Kashmir Shaivism and tips from various scriptures. This is the transcription of my talk at TAO to our regular members coming every Thursday evening to Tao for continuous learning. It is heart to heart talk with people who had been with me for long time and many of them have completed 21 days program. A very hearty welcome to all of you to the sacred learning space called TAO. Today we will discuss something very interesting! How do we get knowledge? Our Rishis were known as Mantra Drashta. All the knowledge that we have today was a revelation to them. When they used to meditate, they got direct knowledge and that is how it happened. Nobody wrote the Vedas. Vedas are revelation. Quran was not written by anybody. Mohammed Prophet was an illiterate but it was revealed unto him. In meditation knowledge happens. Many things have been revealed to the Rishis. For examples most of our shastras it is said, are written by Maharshi Ved Vyas. The tradition says that Vyasji spoke and Ganapati wrote it down. And there is a mention of this in many shastras. In Mahabharata when the war was on Sanjay could see everything as one sees on TV. Sanjay was gifted of this vidya by Rishi for temporary period. That means this vidya could also be transferred like how we give internet cable connection! Also there is truth in it. For example, If I can see certain things and if I have the capacity to transfer it, you will also see and I have done that with more than thousand people here. It means that you cannot deny the fact. For example aura reading capacity, if I have it I can transfer it and you will also read and this has been done with more than 1200 people. People never believed that chakras can be seen with naked eyes because nowhere in the world this has been done. I used to see but even my near and dear ones did not believe and when the resistance to believe is there, criticism is very high. But I took a chance, a very courageous step. I developed the technology and everybody saw. It is about the developing the technology and training methodology by which you can transfer the technology. As I have been a technologist all along I have been doing it, developing the technology and transferring. What I was doing for electronic technology now I am doing for spiritual technology. But my system is fine tuned to do these things. The things which are not normally understood, simplifying the same and making people understand the same is what training is all about. It makes you understand and not only understand, even the capacity is transferred. If you are sincere and honest about learning you can receive that knowledge and thousands of people have received it and you cannot deny it. That is what we need because we have a belief system. Everybody believed in the beginning that chakras cannot be seen because world over chakras have been only visualized. Nowhere in the world is there any institute or class where chakras are shown with naked eyes. They say close your two eyes and your third eye will open and you will see. This is all a mind game. All this nonsense is happening world over but this is not the truth. We have this technology because of which many things have been simplified. We did all this for our ultimate aim which has certain milestones. Now why these milestones are there let us understand. Many of our old friends also have not understood certain things. Basically the technology was developed for creating the confidence in you about me. You will not believe my words unless you experience something extraordinary. For a modern mind to believe something is impossible. But when you start seeing you gain confidence because you see and not because I tell you. When I launched my first aura workshop people laughed at me saying that there is no such thing as aura. People will not see it and people will be after you and will beat you. These were the words of my close friends and near and dear ones. I gave money back guarantee and people saw the aura and nobody took money back. Some people do not have confidence in themselves so they will not have confidence in anybody else also and it does not matter how close you are. The problem with human mind is it will not believe. How to change that mind? The only way to do so is to give a strong experience to that person, which that person cannot deny. If you are seeing something you are seeing it, you cannot deny that. You see aura with your own eyes and you see it repeatedly and you see it in my presence and you go home and there also you see and you know that it is not mesmerism. There is a proper technique and if you learn that you see it. Similarly there is a technique for seeing the chakras. If you understand the technique you can see it, it's no big deal. It is just a matter of learning systematically. Those who have time and attitude of learning, which is a very rare thing, can learn systematically. People ask me over phone how to see chakras!! You come and attend the program, have sincerity of spending time with me and you will see. This cannot be told over the phone. But there are people who say that they have heard that I have some power and that after putting my hand on their head they will be able to see chakras. My putting hand on your head does not mean anything, you have to learn. These are all games of human mind. Lazy people want to avoid learning; they want to avoid working on themselves. They don't want to study, they don't want to learn, they don't want to experiment, and they want readymade results. This is happening world over and I am not for that. Yesterday we discussed about target audience. My target audiences are people who are interested in learning. I don't want people who expect miracles because I don't have any miracles. I have only science, methodology, and technology. It looks miraculous, nowhere in the world these things are there but I do not consider it as a miracle. I consider it as a science because there is repeatability. If there are 50 people, if one sees, second also sees and all of them see. If one in 50 cannot see then it is the person's problem, not mine. But if only 2 can see and 48 cannot then it is my fault, it means that the technique is not working. If majority of people can see and understand then it proves that our methodology is right. In 1991 I met my Master, Sri Dada Gavand, self realization happened in this body in 1992, in less than a year it happened and the scientist within was working because that is the ultimate that is possible in training technology, can you transfer that which is the rarest of rare and the ultimate that is possible? That was the aim with which TAO started. In 1992 it happened and in 1997 we started TAO. The purpose was ultimately to create a technology where self realization can happen to people in a guaranteed manner. If it is a science then it should be repeatable and if it can happen to one it can happen to another person also. That was my aim. I talked about it with many great Masters, even they laughed at me saying that it is a rarity and it cannot happen. When I started aura workshop most of the Masters said that it cannot happen. But I proved that it can happen. Seeing chakras was rarest of rare and people laughed at me again but everybody saw chakras. Enlightenment can happen to everybody and that also happened and everything is now proven. I feel very happy about it, of course it took 14 long years to happen. I have been continuously working with people around. Some people were mesmerized by other Masters and they went away! Like attracts like is the principle. Those who are learning types will stay with me. Those who don't want to learn they will not stay with me because I will not entertain them. Whatever we are practicing here is absolutely pure scientific spirituality. There are no miracles, there are no tantric siddhis, and there is no mesmerism, nothing of that sort. Simple, honest spiritual science is all that is there. Because of high degree of focus we became successful in creating self realization in so many people. It is the absolute rarity on planet earth and never this has happened, producing Buddhas by Batches! I remember when I used to talk about Buddhas by batches, I used to laugh and people also used to laugh but now "Buddhas by batches" can happen and you cannot deny because it happened to you! What we are doing here is the purest of pure scientific spirituality and when we say scientific it means it has repeatability and all my programs have degree of science which talks about repeatability and it is possible to repeat. If it happens to one it can happen to all. How we do it is very simple. The whole methodology of self realization, which is rarest of rare on planet earth, being a trainer I just cut it down to small sets which makes it easier for a common man to understand. 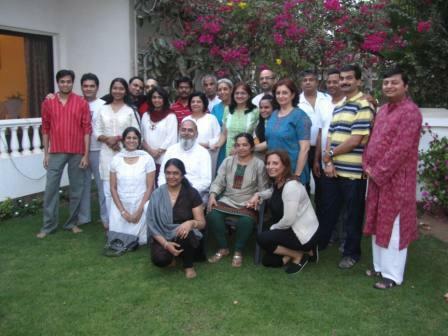 In the first two days of `Art and Science of Holistic Living' you learn kriya yoga. You get systematically initiated into kriya. That initiation is a big thing. You can learn kriya from anybody but that is not called initiation. Initiation is a totally different thing. Initiation means that you get connected to the Guru Mandala, the Astral Masters who start guiding you. Today I have technology which has made even that a simple thing now. Now my research is how to make it simple, how to make it risk free, how to make it perfect so that everybody who come is benefitted irrespective of that person and that person's capacity. My aura reading methodology is like that, irrespective of your personal capacity you will see aura. That is what technology is. You buy TV; you just plug in and start. That is what science is. My methodology is like that. If you come, if you listen, if you have attitude of learning, if you do what I tell you to do, you will get instant results because it is science and it does not depend upon whether you are graduate, under graduate, no matter what. If you are a learner, if you have right set of mind, if you have right attitude you will get ultimate that is self realization. That is why we started TAO, 14years back in1997. We want to make this scientific technology available to as many people as is possible. But it will be only for those who are seriously interested in learning step by step. My entire technology I have put into 21 days. 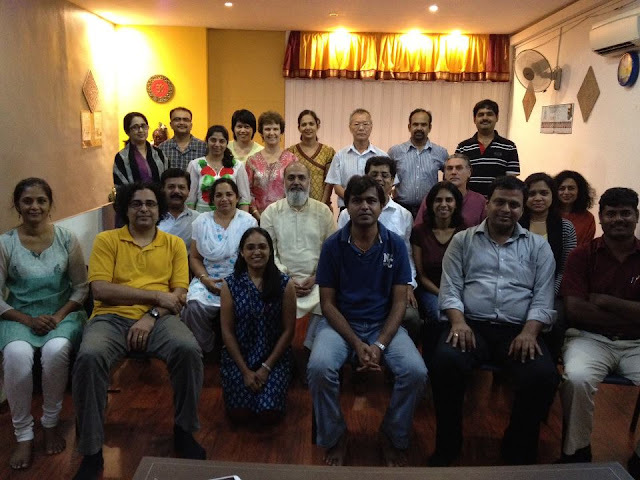 The first two days `Art and Science of Holistic Living' you learn how to do kriya, you get kriya initiations. Second level is also of two days `Power of Super-conscious Mind' which completes your jigsaw puzzle of what is enlightenment, what is law of karma, how it works, what is spiritual science, how it work, all your questions get answered in two days time. The biggest aspect of Level II workshop is understanding of "Blind Spots" and knowing the methodology of how to break through blind spots, how to remove the blind spots. 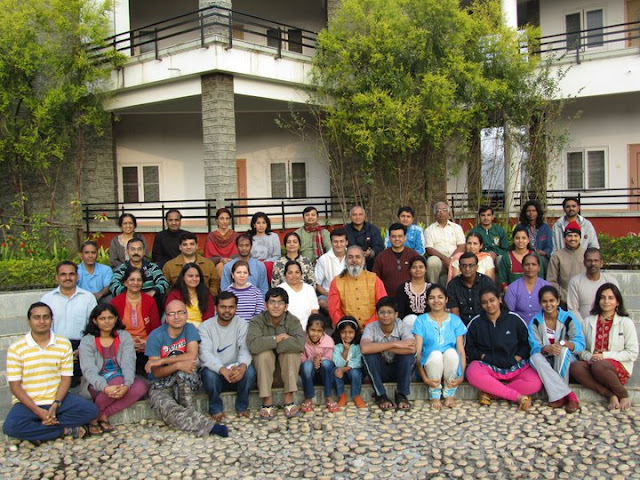 That is the biggest aspect, the core aspect of Level II workshop. You will understand your blind spots and you will get the methodology to remove your blind spots. If you are serious, genuine, if you work hard on that, the methodology is proven because thousands of people have been benefitted but if you don't work, it doesn't work! That is why I say repeatedly that I have no miracle, you have to have attitude of learning willingness to work with me, spend 21 days with me. After Level-2, there is 5 days residential shibir which is `karmakshalan' Shibir. That is a big breakthrough. Small issues related to destiny which trouble you, with karmakshalan, cleansing of the system happen. Fears and phobias just disappear. We had a 54 years old lady who had hydrophobia. With karmakshalan hydrophobia disappeared. Such results are produced because you do kriya and not because I do something. I simply create environment where that magic can happen. In fact it is not a magic or miracle but it is a science and the science has been very properly understood and we created a system where it works wonder. Now karmakshalan is done in a much better way as it is fine tuned and a much better level of understanding is there. Five days is for cleansing the subtle bodies. If you cleanse subtle bodies properly and if you are willing to go for higher understanding where you have to listen; understand and meditate over what has been said and you have to settle in that understanding for which many people don't have the attitude. If you have the attitude you get full result. Suddenly life changes, business which was in losses earlier suddenly improves in spite of same person and factory. Thousands of relationship issues have been sorted out. The tussles in relationships suddenly disappear for no reason. This is so because they are karmic tussles and if the stone of karma is removed then issues are resolved. It looks like a miracle but it is not a miracle it is a science. One who understands that will be benefitted. This is all about doing. Attitude of learning is the main thing. After that there is ADP (Awareness Development Program) shibir for five days. In that your awareness increases. This is supposed to be the most difficult of all. No one knows how to do it. What awareness is also difficult to define. I have written a full article on that. It is there on Yahoo group, on facebook. People ask what kind of awareness whether it is computer awareness, AIDS awareness, swine flu awareness. It is nothing of that. This is so because we always think of awareness related to something. We are not talking in that context. Here we are talking about your own awareness that makes you conscious being, that awareness needs to be developed. That is where the break through happens and that breakthrough is a very important aspect of life. I had been doing research to find out how to make this possible. The whole thing was a big promise to my Master. I knew my Master had all the knowledge but he was not getting a person who could receive that. I offered myself 100% to do whatever he wanted. I told him that whatever you tell I will do. I will not counter question, I will not argue but help me in self realization. He helped me. For three months he explained to me the methodology and with three more months of meditation it happened. It was my promise that if I understood that, then I will spread it to whole world. Without understanding the gravity of that statement I had made that statement. How difficult it is I am realizing now. After 14 long years it happened to some people. But it happened and we want to make it happen in a much bigger manner. I want to do the experiment with a batch of 50-60 people who are willing to walk with me for 21 days. We can create Buddha by batches and we have already done so. There is nothing new about the whole thing. It has already happened to so many people. Those who spend 21 days with me, walked with me, it happened to them. It is not a big deal. It is a matter of understanding. The entire technology is available and proven. If I am talking something new you may doubt but whatever I am talking is already proven. The last seven days is for Tripura Rahasya the ultimate breakthrough where everything is understood. One who has understood Tripura Rahasya may go to any corner of the world, it does not matter. This is so because he has understood and whatever is to be understood is only one thing and one who understands that, has understood everything. One who has experienced the advaita has understood everything, nothing remains. There are many other things also after that but it is an eternal journey. But this is a major milestone. Whoever has understood Tripura Rahasya will not have to come again on planet earth, it is a way to Moksha. You drop out of the wheel of birth and death and that is the real thing. The knowledge for this has come from Trik Shaivism or Kashmir Shaivism. It is Shiv Sadhana but was developed in Kashmir that is why it is known as Kashmir Shaivism. ADP is all about Trik Shaivism secrets and Tripura Rahasya is in continuation of that and while understanding Tripura Rahasya Enlightenment happens. It is a matter of understanding. It happened to everybody who attended the camp. So now very confidently I want to start a new phase of TAO. Those who have attitude of learning and determination to walk the path of spirituality, come, spend 21 days with me and see the miracle happening. I don't have any magical powers, hypnotism, mesmerism, tantric rituals. I have only simple spiritual science and the core aspect is only two words `awareness' and `understanding’. They are the two wings of the bird, eagle. When these two wings are strengthened that person will fly. Seeing the chakras and the aura is all about confidence building, now there is no need to do that. Now we have 21 days program. There is nothing that can be deleted from this program as all things related to confidence building have been removed. Now all this is proven and I don't have to show aura to create confidence. If you have confidence then you come and join 21 days program. This is what is happening at TAO now. Right now my new research is into all types of Samadhi. Next winter we will do a camp in Bhimashankar where all those who have attended Tripura Rahasya can attend and how to experience each type of Samadhi as is mentioned in Patanjali Yoga can be understood. But we saw that attitude of a common man takes time to change. Taking out time for these things is difficult. All the programs are priced at low cost compared to any other program anywhere in the world. So price is not an issue. But the problem is setting aside 21 days for this even though these 21 days are spread over a year. This is the back ground I have created before the presentation of Sri Vidya. This is done because people get carried away by what I am doing. Everything is done with focus on to the ultimate and that is self realization, enlightenment, moksha. We got this human body only for that and the aim for all is only one whether you know it or not. We have to do this before 2012 and that is why we have less time. There is lot of scientific data that is been revealed about the upheavals that will happen in the coming days, before it grips you, you have to awaken to this higher knowledge. The physical body will anyway die whether it goes in 2012 or 2020 or 2050 it does not matter. There are people who know about physical immortality. I know a person who is living for many hundred years and I have met him. But normally a physical body will die. But there some people who are physically immortal. They can disappear and appear in the physical body. They have gone to the higher levels and they are all Ascended Masters. They have gone to fifth dimension and they can manifest in third dimension and that is how physical immortality works and it is a big subject in science which scientist are doing research on and you will get lot of data on net on this subject. This is a reality. If you can convert your body into light body you can disappear into fifth dimension and you can come back in the third dimension, have a physical body at will. There are such people and I have met them… they are really miraculous…. Mahavatar Babaji can come, manifest the physical body, talk to you, there are physical proofs of meeting and then he disappears. Those are the Masters who can create the body at will. This also is a fact. Thousands of people all over the world have this experience with Babaji. If we see these things from scientific angle then we will not understand this as science is very limited. Newtonian science is very limited and it can't prove all these supernatural things but it is possible. In TAO we are not doing any program which is based on supernatural. We are doing normal programs. Enlightenment is birthright of everybody and everybody has the capacity to get enlightened because there is only one criteria and that is human body. Whoever has human body can get it. There are no other criteria like whether you are educated or not. Ramakrishna Paramhamsa, Jidu Krishnamurthy, Albert Einstein all were enlightened beings and they were not educated. So there are no other criteria and an only criterion is human body. So there are no criteria who can attend my programs. Only human body and attitude of learning is the criterion. Human bodies but with no attitude of learning will not get anything from me. Where does Sri Vidya come in all this? To set your life and solve your household problem we have holistic prosperity and it is essential. For a householder it is a must. For a sanyasi who has left everything and is not concerned with family, it is not required. But that is not our way. Our way is of grihasthi dharma. Handling our job and householder' s responsibility and also social responsibility we have to attain to Moksha, which is a far more difficult job. But we have been successful in doing it and it is enjoyable also. All those who attended the shibirs know that there was not a single moment which was troublesome. This is so because of the technology. Such a wonderful opportunity is available; many new people who come to TAO do not understand that we are very serious experimenters on the path of enlightenment. Those who are learning oriented should go for this 21 days program and do it systematically. But what is required is time and little bit of money for creature comforts at resorts… for doing all this and to get that we have Sri Vidya. If you have no background then there is problem. We should not deviate from our main aim. For the last 14 years I never deviated from my aim even for a second. The focus never shifted. All the time went in creating confidence otherwise this was available 14 years ago also. The ADP shibir that happened, actually TAO started with ADP program only, 14 years back. But nobody understood it then! Now everything is standardized in the form of 21days program… just walk the path! One more batch of Buddhas at Tao!!!! Dear Sonia, Next batch of Level-1 program is planned on 1st & 2nd May at Tao, Thane. You can start with this. 21days are spread over few months (2 + 2 + 5 + 5 + 7 = 21Days). Love, Om Prem. Buddha's by batches is very much possible. It is possible for a master who is settled in Shiv Vyapti. Its up to the seeker how much he/she can absorb. Master is there always to offer but the seeker must ready for that and for the same seeker must be like a sponge and absorb all that master is offering. We're very blessed to walk the path with you, a true master who is settled in Shiv Vyapti. Guruji, I am interested in attending the 21 day programme. Please tell me when should I do so that I can make leave arrangements. Holistic Counselor, Corporate Trainer, Seminar and Workshop leader, Author, Speaker, Motivator, Kriya Yogi, Scientific Mystic, Enlightenment Educationist, Para-Advaita Teacher.